The sterling silver reduced replica cross pendant gifts given by Bishop Rickel have been well received by many. We are now working on some new options such as these for his continued gifting of small replicas of his pectoral cross. These shown are all made from impressions taken of the flora and fauna in the Bishop's diocese in Western Washington state and replicate his pectoral cross in shape. 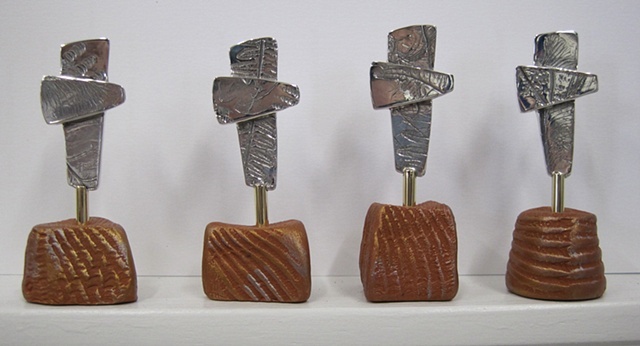 The impressed sterling crosses are mounted in stands made of polymer clay impressed with seashells gathered from the coastal areas of his diocese.